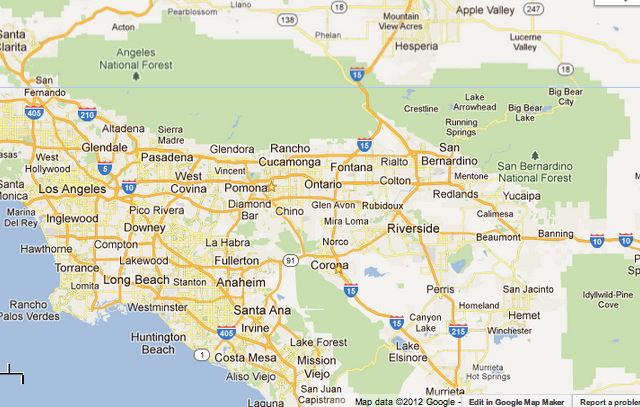 The Inland Empire is a metropolitan valley immediately east of the Los Angeles metropolis. Often overlooked because of the immensity of Los Angeles, the Inland Empire is its own unique area of 4,300,000 people. It is framed by mountain ranges on all four sides, and is 45 miles in length east to west and 15 miles wide north to south. A valley of 28 cities, the Inland Empire is anchored on the east by the cities of San Bernardino (200,000 population) and Riverside (305,000), and on the west with Ontario (164,000) and Pomona (152,000). It is the 14th largest metropolitan area in the United States, consisting of a population distribution of 44% Hispanic, 18% Anglo, 7% African American, 6% Asian, and 25% mixed race (the 2010 U.S. census). It consists of the eastern edge of Los Angeles County, and the western portion of both San Bernardino and Riverside counties. If anything can be said of the Inland Empire, it is that it is poor! It has the one of the highest unemployment rates in the USA (15.4%). Unemployment stands at 14% for Pomona, 15% for Ontario and Riverside, and at 20% of the employable population for San Bernardino. But these figures are deceptive. The unemployment figures of the federal government consists only of those people who have been unemployed for less than two years and are receiving unemployment compensation (U3). It does not include those who have been unemployed for more than two years but continue to look for work, those who have given up seeking for jobs, those who have gone back to school (e.g., graduate students) because they couldn’t find a job, those who are self-employed but whose businesses have gone bankrupt, and those who are seasonal workers (U4-6). Counting all the truly unemployed, the figures are shocking: 35% unemployment in Pomona, Ontario and Riverside, 50% in Bloomington, and a shocking 55% in San Bernardino. There are other signs of the depth of poverty in the Inland Empire. 31% more residents live below the poverty level than was the case in 2007. Although the Inland Empire is the largest warehouse center in the United States, its employees make only $8 per hour. And at present, the value of Inland Empire homes is about half what it was in 2006. 63.6% of all children in IE schools fall below the federal poverty level. Economists predict that it will likely take until 2040 for the Inland Empire to return to fiscal equality with 2007. There are few communities more in need of broad-based organizing than is the Inland Empire. And ICON is organizing it around the people’s issues!